Project tracking is an important step in the project management process. When you track a project that has uncertainties, you can apply newly obtained knowledge about project performance and recalculate the project so that it is an accurate reflection of the project’s progress. RiskyProject uses unique mathematical methods to calculate projected duration based on this tracking information. 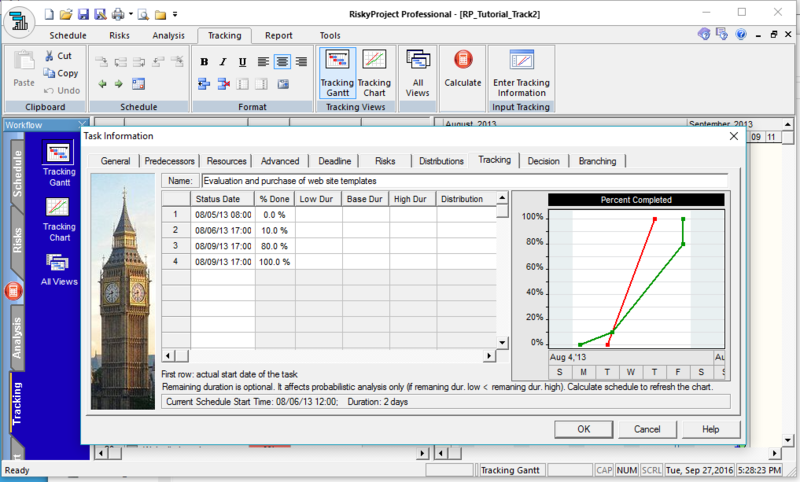 In addition, RiskyProject automatically updates the chances that specific task risks will occur. For example, if at the start of a task a risk has a 50% chance of occurring over the duration of the task, if the task is 50% complete, there is a reduced chance that the risk will occur.